Edition takes the motoring association one step further. Acknowledging Tissot and Alpine’s winning history, which began with a partnership in 1973 when the legendary car A110 won the Rally World Championship, it now celebrates the new Alpine A110 with this exciting special edition, limited to just 516 pieces. Innovative details from the original proudly remain, with the perforated bracelet invented by Tissot in 1962, which nods to the steering wheels of cars from that time still a stand-out feature. Other touches from the motoring world can be seen in the case, which takes the shape of the bodywork, and the pushers which portray the pistons. 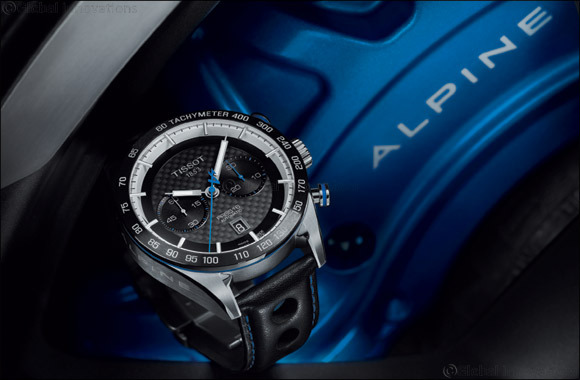 Details are picked out in the familiar Alpine blue, which adds a sporty touch to the high-tech, feather-light carbon of the dial and contrasts flawlessly against a steely black ceramic bezel and luminescent hands. Detailed patterns on the dial, which see the hands pass under the floating indices, add an appealing depth, while the hand shape itself is unique, and nods to the A of Alpine in the seconds hand. The Alpine name is further referenced on the side of the case, showing how proud Tissot is of this fruitful partnership. Finally, as always, the technology at the heart of the watch is impeccable, with an A05 automatic movement with a power reserve of 60 hours driving this beautiful piece.